CLICK FOR PDF OF JAN/FEB 2019 PRINT ISSUE. Story originally published by ND Works. “To prepare students for leadership roles in a changing global landscape, we are bringing Notre Dame to the world and the world to Notre Dame….” -President Rev. John I. Jenkins, C.S.C. There is power in that statement. Intention. The message is also tangible. The University’s commitment to internationalization is demonstrated through the opening of the Keough School of Global Affairs in 2017, Notre Dame’s first new school in nearly a century; the development of diverse academic programs and study abroad opportunities; the recruitment of more international students and faculty; the financial support of collaborative and innovative faculty research abroad; and the deepening existing of global partnerships and programs and the genesis of even more. While all departments and divisions are called to take part in the extension of the University’s global reach and impact, Notre Dame International and the Keough School of Global Affairs are the catalysts in what is an extraordinarily dynamic time in Notre Dame’s history. “We are proud to be an ambassador and driver of the great work being done all over the world by our faculty, staff and students as they conduct study and cutting-edge research to solve global challenges,” says Michael Pippenger, who as vice president and associate provost of internationalization leads NDI. When Pippenger talks about internationalizing Notre Dame, he points to three specific initiatives: research, engagement and exchanges. In the past two years, NDI has added four new international collaboration grants to its portfolio, encouraging faculty research and scholarship, and continues to join with campus partners to help provide other funding opportunities. “We support global research so faculty can work with international partners to make new discoveries and transform the world we live in — that’s good for all of us,” says Pippenger. It is critical to the University’s internationalization efforts that Notre Dame attract the best and brightest scholars, students, faculty members and visitors to campus, says Pippenger. It’s equally important to get the Notre Dame community into the world to learn and work. 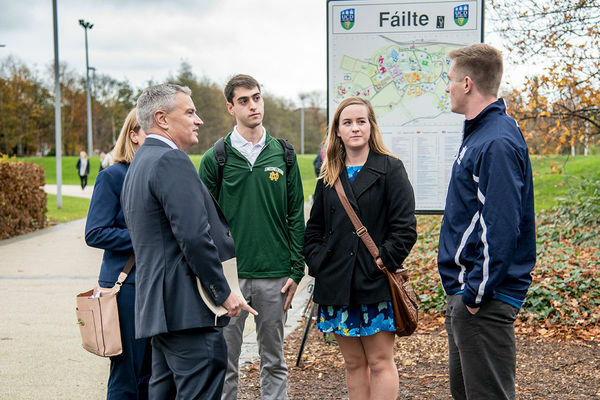 In addition to expanded study abroad opportunities, NDI created five Global Gateways (in Beijing, Dublin, Jerusalem, London, and Rome) and six Global Centers (in Santiago, São Paulo, Mexico City, Hong Kong, Mumbai, and at Kylemore Abbey in western Ireland) strategically located where Notre Dame seeks to have a meaningful presence in the world, given its Catholic identity and research expertise. It’s important to Pippenger that his team support campus partners through increased international exchanges. Recently, his team has supported Campus Ministry, Student Affairs and Athletics in this way. For example, in August NDI worked with the Federation of University Sports of China (FUSC) to organize a clinic and camp in China for Notre Dame’s fencing coaches. Meanwhile, a Chinese college women’s soccer team visited campus to learn more about conditioning practices here and exchange ideas. Pippenger seeks to also cultivate similarly beneficial exchanges between the South Bend community and the University. For Scott Appleby, Marilyn Keough Dean of the Keough School of Global Affairs, the conversation about internationalization starts with Notre Dame’s mission to place scholarship in service to the common good. Whether through research into peace and conflict, the protection of human rights or programs to fight poverty and provide educational and economic opportunities for the world’s lowest-income countries, the Keough School strives to provide an interdisciplinary education that integrates research, policy and practice. The Keough School extends the University’s international reach through transformative educational programs and global engagement partnerships. The school includes nine institutes, each addressing a different dimension of global affairs. Keough welcomed its first class of students in the Master of Global Affairs program in August 2017 and currently educates 75 students from 30 countries. A new undergraduate major will be inaugurated this semester. Building on efforts to help cultivate global citizens and formulate effective public policy for vulnerable populations, the Keough School opened a new office in Washington, D.C., that will help bring together various Notre Dame groups and public officials at the nation’s capital. “Global leaders and policymakers engage our faculty and students in D.C. to influence ongoing discussions around policy, foreign aid, trade, conflict resolution — the whole gamut of issues we’re studying in the Keough School,” says Appleby. Ultimately, Appleby says an important metric of the Keough School’s success is how well students are placed in positions of influence and leadership in government, the private sector and international development organizations. It’s why his team wants to position these students as global citizens and help guide them in careers that take on a global profile. “We seek to be an important player in globalizing the education of Notre Dame students,” says Appleby. Both Appleby and Pippenger acknowledge and are inspired by the internationalization work that still lies ahead for the University, but are grateful for those who have built the international portfolio that they inherited. “Notre Dame has a rich and varied history of global engagement. These values were embedded within the University from its founding by Father Sorin, an immigrant who brought European ideas about education and community,” says Pippenger. Traveling internationally for Notre Dame? There’s a registration for that. Originally published by Colleen Wilcox, Notre Dame International at ndworks.nd.edu on January 07, 2019.